Sheryl O’Loughlin earned her MBA from the Kellogg School of Management at Northwestern University. She is the CEO of REBBL super-herb beverages, and she previously served as the CEO of Clif Bar, where she led the concept development and introduction of Luna Bars, and was the cofounder and CEO of Plum Organics. She is the former executive director of the Center for Entrepreneurial Studies at the Stanford Graduate School of Business. She lives in Santa Rosa, California, with her husband, Patrick, and her two sons. — Denise Brosseau, serial entrepreneur and author of Ready to Be a Thought Leader? I adore this book. Entrepreneurship is one of the most difficult-and yet most rewarding-career paths anyone can take. 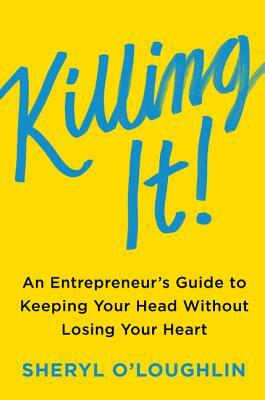 In Killing It Sheryl brilliantly captures the ups and downs of her own journey and distills them into a guiding principles every entrepreneur should use. — Nancy Duarte, bestselling author and CEO of Duarte, Inc.
Sheryl O’Loughlin brings a unique and deeply personal perspective to what it means to launch a successful start-up. Sheryl opens up about the true costs, as well as the joys, of entrepreneurship. This book is a trusted companion for business leaders. A thought-provoking and honest work by a successful entrepreneur with insights into the realities and issues of starting and running a business. Highly recommended. So many aspiring entrepreneurs have no idea what they’re in for when dreaming about their start-up. Sheryl O’Loughlin’s Killing It! condenses decades worth of hard-earned wisdom into a compelling and personal manual for success both as an entrepreneur and a human being.